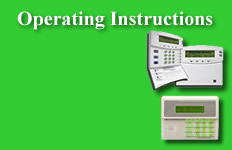 Find the appropriate operating instructions for your burglar and/or fire alarm system keypad. Control personnel access to locked doors by using keyfobs, keypads, proximity cards, or remote transmitters to unlock doors. Limit entry to your property by using motorized gate operators controlled with Keypads, Telephone Entry Systems, and Remote Transmitters. Installation, Maintenance, and Repair of Residential and Small Commercial fire alarm systems. Installation of telephone jacks, telephones, and telephone systems for residential and small business applications. Cat 5, Cat 5e, and Cat 6 Cabling for all computer systems. From one wire run to infinite wire pulls. Installation of Computer Rack Systems, Patch Panels, Computer Switches and Wire Systems. We can reprogram most existing alarm systems so that we can monitor YOUR alarm. This usually reduces your monitoring cost. Contact us for an evaluation of your system.